Venture out of the city with trips to Kintamani (Mt Batur & Lake Batur (Danau Batur)), Klungkung (Pura Taman Sari Klungkung & Puncak Mundi Temple) and Gianyar (Bali Safari & Marine Park, Erjeruk Temple, & more). For traveler tips, photos, reviews, and tourist information, read our Tegalalang online driving holiday planner . Bogota, Colombia to Tegalalang is an approximately 38-hour flight. Traveling from Bogota to Tegalalang, you'll lose 13 hours due to the time zone difference. Expect warmer temperatures when traveling from Bogota in October; daily highs in Tegalalang reach 36°C and lows reach 28°C. You will leave for Amed on the 20th (Sat). You'll find plenty of places to visit near Amed: Manggis (Alam Zempol Natural Bath and Aroma Product, Mendira House, & more), Candidasa (Wacky Jacky's, Guungan Hill, & more) and Karangasem (Besakih Temple, Asah Hill, & more). There's still lots to do: see some colorful creatures with a scuba or snorkeling tour, admire the natural beauty at Tirta Gangga, take in the spiritual surroundings of Silayuki Temple, and contemplate the long history of USS Liberty Shipwreck. To find ratings, traveler tips, maps, and more tourist information, you can read our Amed trip planner . Drive from Tegalalang to Amed in 2.5 hours. In October, daily temperatures in Amed can reach 38°C, while at night they dip to 26°C. Wrap up your sightseeing on the 9th (Fri) early enough to drive to Kuta. You'll find plenty of places to visit near Kuta: Pantai Batu Mejan (Echo Beach) (in Canggu), Ubud (Spas & Wellness, Threads of Life, & more) and Tanah Lot Temple (in Beraban). 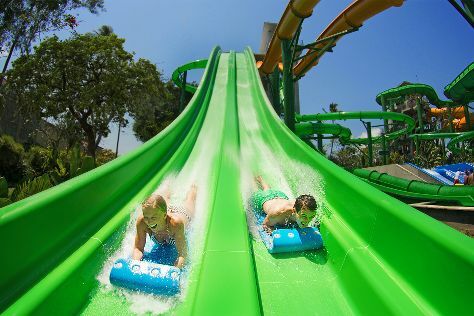 The adventure continues: make a splash at Waterbom Bali, kick back and relax at Bingin Beach, see some colorful creatures with a scuba or snorkeling tour, and stroll through Nusa Dua Beach. For photos, reviews, maps, and tourist information, read Kuta planning app . Traveling by car from Amed to Kuta takes 2 hours. Alternatively, you can take a bus; or take a bus. In November, daytime highs in Kuta are 37°C, while nighttime lows are 29°C. Finish your sightseeing early on the 28th (Wed) so you can travel back home.